Are you planning only for short-term survival, or are you planning to stick it out for the long-term? This is a question that you need to think about. If you are of the opinion that the only situations which need to be prepared for are short-term disaster situations (hurricanes, blizzards, earthquakes, flooding), then you’ll likely focus on things like stockpiling food and water and basic sanitation to get you through 1-4 weeks of inconvenience. Frankly, this kind of prepping isn’t terribly difficult, and anyone can do this on a modest budget. But, if you’re looking long-term, then you’ll want to think about more than just stockpiling for a short-term inconvenience; you’ll want to plan on renewable food sources. In other words, you’ll want to grow your own food (and maybe learn to hunt and fish). The kind of garden that you’ll want for long-term survival is about more than just having a few fresh vegetables on your dinner table. So, how do you go about setting up your survival garden? Well, according to Adam Torkildson, there are four big strategies that you need to use in your survival garden. In nature, plants must share water, air, and sunshine, and they protect one another from pests like bugs and birds. This is typically achieved through loosely organized concentric circles. At the center is the tallest point, a large tree that protects shade-loving plants. Outside the shade grow thick shrubs that keep away larger pests like rabbits and voles and outside them, fragrant herbs that keep away smaller pests while attracting pollinators and protective insects like bees and wasps. Another nice benefit is, if you set this up right so that it looks natural, you’re less likely to draw the attention from people who want to take your food because they will be less likely to see that it is actually a food source. The second strategy is to choose the right plants. You’ll want to make sure that what you plant can successfully grow in your area and in your soil. In this, you’ll need to do some research to maximize the potential of the climate and soil that you have. The easier you make it to get to your front door, the more likely you are to have visitors. Thus, the attractive and inviting front walkway will need to go. Instead, you should try to make passage into your domicile as confusing and discouraging as possible. 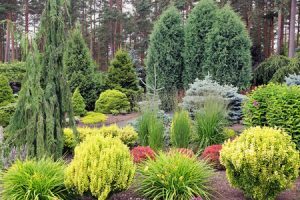 Around the exterior of your yard — around the valuable crops of your natural garden — and along the narrow, winding passageway to the interior, you should install plants that are less-than-inviting. Finally, the last strategy is to be a diligent gardener. Yes, you want to set up your garden to require as little maintenance as possible, once set up, but that doesn’t mean that you won’t ever need to do anything. A garden, like anything else, can fall into disrepair and must be worked on to continue to receive maximum yield from your plants and to keep your defensive plants from overrunning your entire garden. So, there you have four strategies to work through as you plan and maintain your survival garden. Do you have other strategies worth keeping in mind? Share them below.